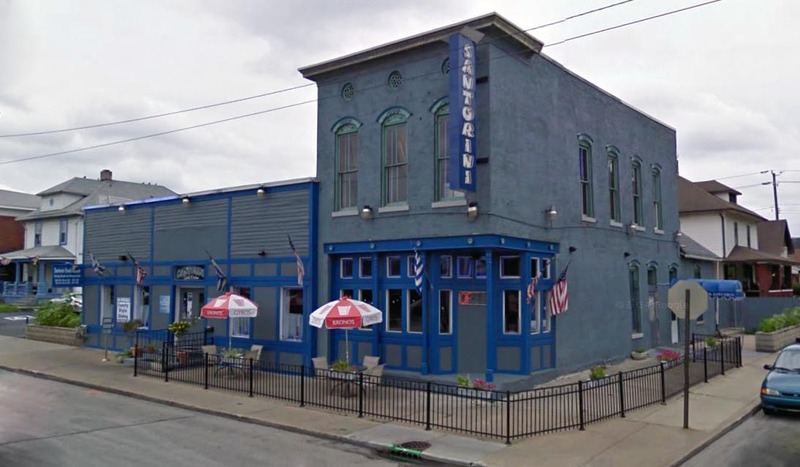 Fountain Square neighborhood on the southeast side is becoming one of the most desirable neighborhoods in Indianapolis with a mix of affordable housing, a thriving commercial district, interesting cultural events, and many popular restaurants and bars. But to many of us, it’s the area’s history and older structures that give it character. Next time you visit the Santorini Greek Kitchen on the southeast corner of Prospect and Laurel Streets, try to envision a visit to the Charles H. Buddenbaum Grocery in the 1880s. 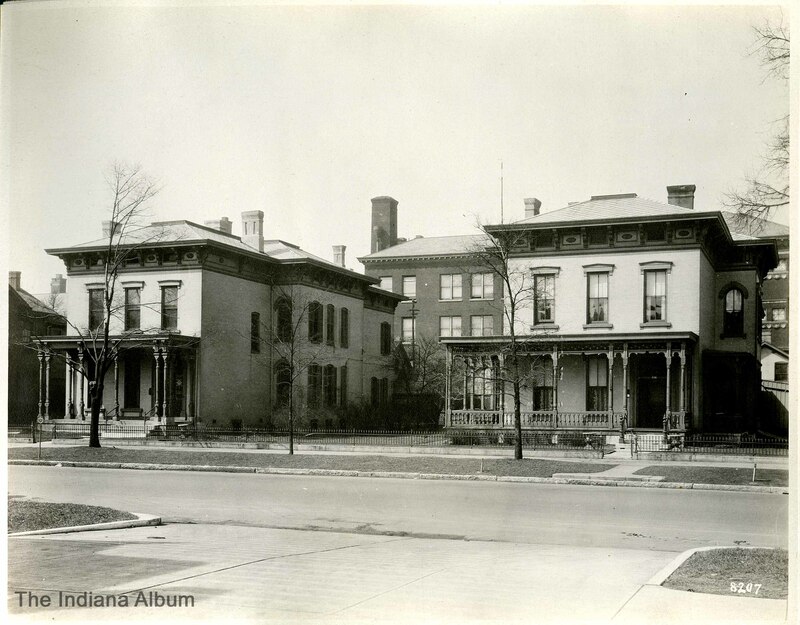 Fountain Square’s two main commercial corridors–Virginia Avenue and Prospect Street–developed in the 1860s and this section of town became known as “the end” since it was at the end of the streetcar line. Located just a couple blocks east Shelby Street, this brick Italianate store dominated the corner and one can imagine neighbors gathering around a pot belly stove to gather goods and local gossip. 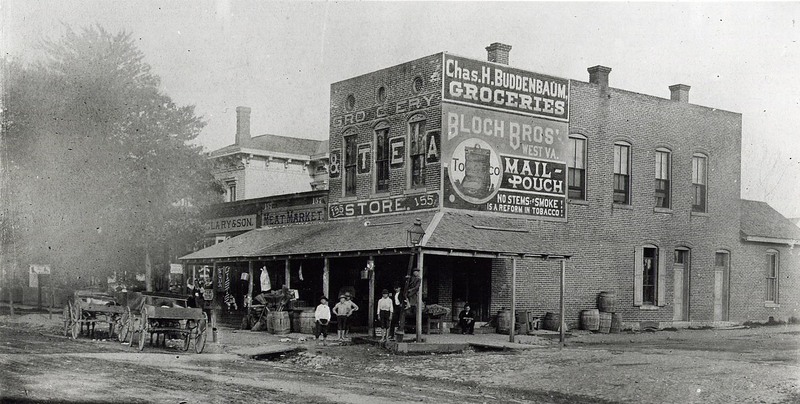 Charles H. Buddenbaum (1860-1907) grew up in the grocery business and in 1882 married the daughter of Frederick Ostermeyer of Severin, Ostermeyer and Company, one of the city’s most prosperous wholesale grocers. At age 22, Charles is first listed as proprietor of the grocery store pictured above. Signage painted directly on the brick, as was popular during this era, identifies it as a Grocery & Tea Store. Perhaps the meat market in the adjacent one-story structure was part of the business, too. The dirt street in front (to the left) is Prospect Street and the address at this time was 155 (variously known as 1413, 1415, and 1417 Prospect after 1897). By the early 1890s Buddenbaum took a business partner and moved the Buddenbaum and Heller Grocery half a block west to 1321 Prospect. For many decades afterward the old grocery was occupied as a drugstore, including Clary’s Laurel Pharmacy in the 1890s, Stuckmeyer Drugs in the 1910s and ’20s, John Cochran Drugs in the 1930s and ’40s, McKean Drugs in the 1950s, and Crescent Pharmacy in the 1960s. By 1975 the corner store housed Mills Furniture and Appliances (adjacent to the Swing Bar at 1417 Prospect). The Woodcutters’ Bar occupied the one-story section in 1985. The store extended outside under the L-shaped porch that protected barrels full of brooms, stacks of wood, and produce. Signs promote soda and and cigars. The photograph at the Indiana State Library, actually a copy of the original, has handwritten notations indicating Prospect and Laurel Streets and the date “1880 ?.” Two of the people posing for the photographer are identified as Harry Drotz and Jess Mount. The family of Emile and Elizabeth Drotz lived at 155 Prospect during the 1880 census with the French-born father listed as a retail grocer and 19-year-old son William employed as a grocery clerk. Harry was born in 1875, making him about the right age to be one of the boys (perhaps the boy climbing the gas-light pole). Jess H. Mount, born in 1870, lived with his widowed mother Julia Mount and four sisters just a few houses east at 179 Prospect (where the Buddenbaums lived just a few years later). Perhaps because of his early years growing up near this store, Jess Mount spent most of his life in the grocery business from owning a vegetable huckster wagon to operating a grocery at 1435 Prospect Street. It is likely that this photograph was taken shortly after Buddenbaum took possession and had the signs painted in about 1881 or 1882. In 2001 Taki and Jeanette Sawi, who first met on Santorini Island, opened Santorini Greek Kitchen on Shelby Street in Fountain Square. They quickly needed more space so they moved to 1415-17 Prospect in 2004. The award-winning authentic Greek restaurant suffered a fire in 2010 but rebuilt and is known today as one of the best Greek restaurants in town. What do you remember about this historic Fountain Square store (reputedly built in 1858 according to one article)? Did the drugstore have a soda fountain? Did you frequent the adjacent bars? Did you ever occupy the upstairs apartment? Are you related to any of the former owners? 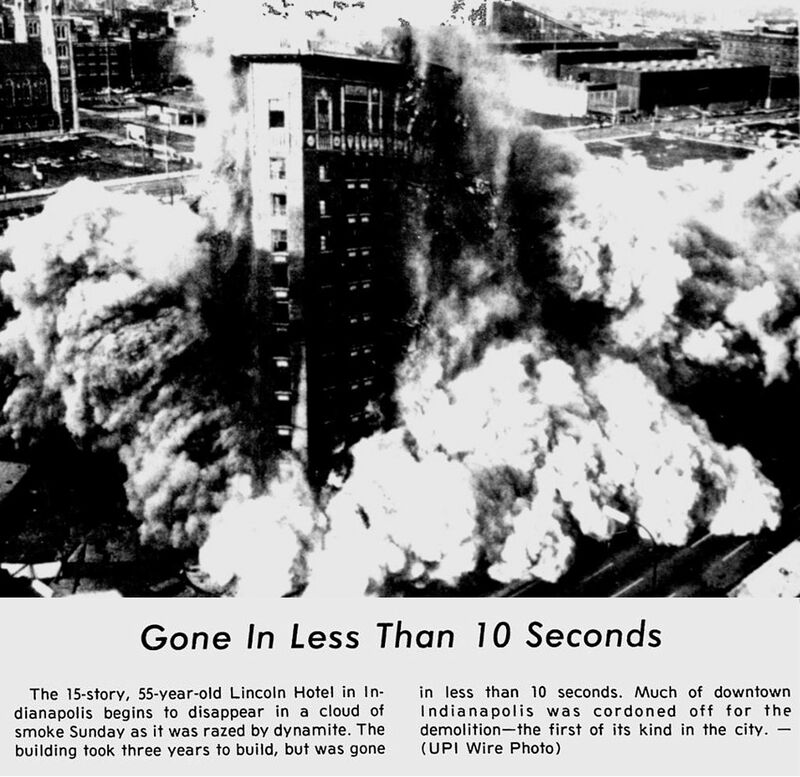 Please share your memories and any other photographs of the building or neighborhood through the years. Thank You! Found this article particularly interesting since in the 50’s and early 60’s my great aunt and uncle, Ernie and Helen Perry, lived in the west side of the double just east of what is now Santorini, the white house visible in the 2009 photo. We visited quite often and I do remember the bar at the corner, occasionally would get loud. In the early to late 1990s, the sign on this establishment was “Leroy’s Woodcutter Bar”. Many locals nicknamed it “The Throat Cutter”, due to a reputation, deserved or not, of rough and rowdy behavior. I personally never experienced such in my few visits there. My Father-in-Law, Edward Cunningham. and the McHugh family owned the bar next to the drugstore (the one-story side) from approximately 1936 to 1955?. It was called The Moonglow. They also owned the empty lot next door for parking. They were Irish immigrants. My late husband Cortland W. Shea grew up best friends with the Buddenbaum family (Frank? and ? ), and I think they were neighbors of Will and Pearl Shea on Poplar Road in Irvington. In any case, when my husband passed away in l994, we honored his wishes to avoid deadly calling and have a live band, open bar — a first in the newly opened Crown Hill Funeral Home. He was a Purple Heart AF veteran serving with RAF in England, later Korea–so his closed coffin had his military medals, hat, etc. He was also a nightly martini-or-two veteran, so we added his nightly glass complete with fake olive. I mention this because when the dear, dear very senior Mr. Buddenbaum was brought to the coffin by Frank, he remembered Cort’s childhood and military service but was puzzled by the unfamiliar glass, until someone told him Cort was never seen after 5 p.m. without the martini in hand, prompting him to question what exactly was a martini? He found out–someone took him to the bar, complete with ice carving and martinis on the rocks. I think he must have been in his high 90’s but a few minutes later he was manfully drinking–and enjoying–his new drink. The Shea family adored the Buddenbaums. No idea if Frank or his family is still around? Thank you for sharing this information and pictures. My father’s name was Harry Charles Buddenbaum. I am curious and intrigued by my family’s history. Loved to read this and post on my facebook. Charles H Buddenbaum was my great-great-great-grandfather. My mother, Kathryn Walson (nee Buddenbaum), told me about the store, and it is great to learn more about its lore and history. Another friend who lives in Indy says that she loves to eat at Santorini’s! Small world. From 1960 to 1964 I worked for Crescent Pharmacy which was in this building. The east portion was a bar and on Saturday nights the common wall vibrated from all the noise. Across the street to the right was Ray Joseph’s one room grocery. I delivered prescriptions on my bike, worked as a cashier, stocked shelves and more. My starting pay was 65 cents an hour. Cokes were 10 cents. Comic books were 10 cents. Candy bars were 5 -10 cents each. During that time there were three different owners (Duane Heiny, John Schneider and Joe Bunnis). To the ladies Duane was a greek god. Tall dark and handsome in his white pharmacist jacket. One day Duane had a nervous breakdown and I drove him to the Veterans Hospital. Then John Schneider bought the drugstore. John liked to sell Paragoric by the quart illegally(an opium derivative). One evening John and I were held up by two guys in bib overalls. After grabbing their gun he was shot in the leg. I was 16 years old and scared stiff. Not long after that John was taken away by the police and Joe Bunnis bought the store. Joe’s pastime was calling his bookie to bet on the horses. Needless to say I learned a lot working for that trio of characters while living just a few houses away at 1317 prospect myself(the old flowershop). I left Crescent when I enlisted in the US Air Force in August of 1964.